When it comes to psoriasis triggers, medical professionals have identified that there’s a deep link between psoriasis and alcohol, but also psoriasis stress. According to the latest medical findings it seems that a series of external factors can make psoriasis worse in those who already have it. However, for people who don’t really know too much about it, what is psoriasis? 3 What Triggers Psoriasis Flare-ups? 7 What are the aspects of psoriasis which generate stress? Psoriasis is characterized as being a scaly and dry skin disorder which is caused by the immune system being triggered by mistake and result in an overproduction of skin cells. Usually, the production of new skin cells takes anywhere between twenty one and twenty eight days, but for those who are suffering from psoriasis, this process is shortened to around two to six days. On a global level, psoriasis affects around 3 percent of individuals and it generally develops in patients aged between eleven and forty years old. Regardless of the fact that psoriasis is not contagious, sufferers have to deal with harsh social behavior, discrimination and exclusion. The cause of psoriasis still eludes doctors and even until this day it is a big mystery. But there’s a good chance that a big part of the story is the interplay between triggers and genes. 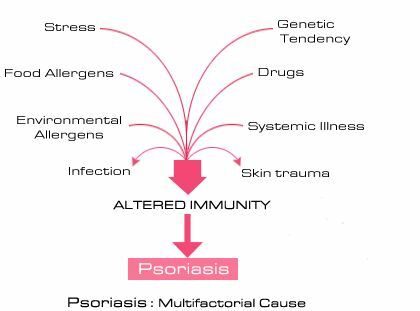 According to medical professionals, psoriasis can be triggered when something will meddle with the person’s immune system, while when it comes to psoriatic arthritis (a type of psoriasis that will affect the individual’s joints) both environmental factors and genes play a role in its development. One in ten people have genes that expose them to the danger of suffering from psoriasis sooner or later in life, yet the fact is that many individuals who suffer from it don’t report having relatives with the disease. One thing is for sure though: there are certain genes that are triggered which will eventually cause people to suffer from psoriasis, but these genetic connections are not yet known. Medical specialists say that this is not a simple genetic program like blue or green eyes, where it basically passes through a family in a certain pattern. On top of that, this is also not a disease which could be categorized as being strictly genetic. It’s more like a tendency towards disease, probably brought on by an assortment of genetic changes. For instance, errors in DNA chemicals may cause misplaced, misshapen or missing proteins. 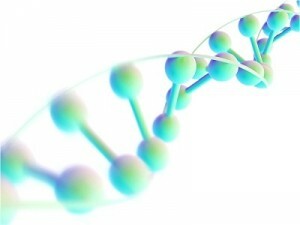 People who develop psoriasis have a specific combination of genes that leads to them suffering from it and currently researchers in the medical field are still working in order to determine these genes. After they’ll manage to do so, they’ll gain an even better understanding of psoriasis and it’s then that a cure may be on its way. What is strange though is that a large part of the population has these genes, genes which make them predisposed to psoriasis, but eventually around two to three percent of them will develop it. Given that, the only conclusion one can reach is that in the absence of certain triggers, psoriasis will not appear. Smoking: Many health experts believe that people who smoke have a higher chance of worsening their psoriasis. Alcohol: It has been observed that men who consume alcohol are more likely to suffer from flare-ups. Trauma to the skin: In some individuals who suffer from the disease, experiencing trauma to the skin, including tattoos, vaccinations, bumps, burns, bruises and cuts can cause flare-ups of psoriasis at the site of the injury. Infections: Various types of infections such as tonsillitis or strep throat will generally result in different types of psoriasis, such as guttate psoriasis. Those who suffer from HIV will experience a worsening of their symptoms. Certain medications: Drugs like beta blockers (which are used for treating some heart arrhythmias, heart disease and high blood pressure), drugs for malaria and lithium (a common treatment used by people suffering from bi-polar disorder) may be responsible for flare-ups. Stress: Only the simple fact that someone suffers from psoriasis can put stress on them and that is why most of the times patients will experience an outbreak of their symptoms in times of stress. Dry and cold: Because dry and cold weather will greatly affect the skin, the chances of flare-ups increase a lot. In contrast, sunny and hot weather seems to help individuals with controlling their psoriasis symptoms. Indomethacin: An anti-inflammatory, non-steroidal drug. Various heart and blood pressure medications like Quinidine or Inderal. Lithium (a drug that’s generally used for treating patients with different psychiatric disorders). Corticosteroids: These medications are used for treating psoriasis and they can be quite effective. Because they range in potency from extremely mild to very strong, they can help sufferers of the disease by alleviating their symptoms a lot. Those who choose to take these medications should take them as advised by their doctor. Sudden withdrawal or overuse of certain oral corticosteroids can make their psoriasis even worse. For those who have a family history of psoriasis or suffer from it themselves, it’s recommended to inform their doctor about these medications just to make sure he knows about all of them and prescribe alternatives. In some cases, reports from patients said that infections like a simple strep throat may be responsible for making the disease worse. 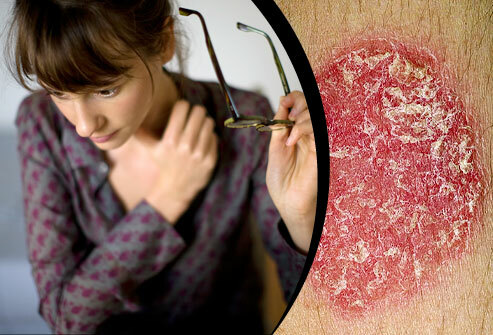 This has been particularly linked to younger people and they have a higher chance of worsening their psoriasis symptoms if they suffer from an infection like this. The good news is that as soon as they start treating the infection, the psoriasis symptoms will subside. There are many other triggers which have been linked to psoriasis and they include the heavy use of alcohol, smoking, diet and allergies. Recent studies have shown a clear link between psoriasis and stress and while stress is very well known for causing a worsening of the psoriasis symptoms, the disease itself can make people feel even more stressed. So how are psoriasis and stress actually linked? The truth is that experts are not completely sure yet. They believe that it may have to do with an effect on the immune system. This is because many individuals usually experience their first psoriasis flare-up during stressful times. What are the aspects of psoriasis which generate stress? Life with disease: The sad part of suffering from psoriasis is the fact that currently, there is no known cure, so when it’s bad it can really wear sufferers down. Even when they are feeling very well, most of them may find themselves worried about their future. What if it will get even worse? Treatment: Even though it’s “good”, treatment is one of the many psoriasis stress triggers and that is because certain therapies demand a certain level of commitment. For instance patients may need to undergo phototherapy sessions which they need to attend 5 times per week for as long as 1 year. For most people, fitting that into their already busy and crowded schedules is by no means simple. And at the need of the day, everyone knows that it’s extremely stressful to try a treatment for several months which eventually provides little or no positive results at all. Pain: A lot of psoriasis sufferers complain about the chronic pain they have to live with on a daily basis. In time, this adds up to a lot of stress and makes their life pretty miserable. In some cases the pain can greatly interfere with one’s ability to do daily activities, which is especially true for those with psoriatic arthritis of the hands. Finances: In terms of cost, psoriatic treatments can get quite expensive. For instance, undergoing a year’s worth of biologic medicines can add up to over 25.000 dollars. Stigma: Those who suffer from psoriasis may sooner or later become ashamed and self conscious. Because of that, they’ll find it hard to socialize and this will lead to an increased amount of stress. From merely shaking someone’s hand to going on a date, the pressure can get really get to them. 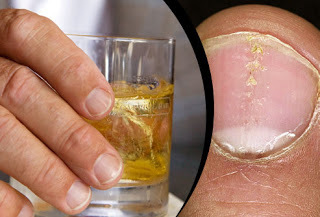 The psoriasis and alcohol link has been determined by specialists quite a long time ago and there is extensive evidence that proves the fact that people who consume alcohol will likely make their psoriasis symptoms worse. The type of alcoholic beverage and the amount of alcohol consumed have both been shown to increase the risk for the exacerbation of plaque psoriasis or its development. A recent study following 82,870 women over an extended period of fourteen years demonstrate that consuming more than 2,3 alcoholic beverages a week was a major risk factor for new onset of psoriasis. According to data from the same study, women who chose to consume non-light beer exposed themselves to the risk of developing psoriasis. When it comes to men, consuming alcohol in higher than recommended doses (at levels higher than one hundred grams per day) seems to be a great risk factor for the development and increased activity of the disease. Patients who’ve chosen to indulge themselves to alcohol while suffering from psoriasis have shown a decreased treatment response. What was interesting in the findings of the study was that heavy drinkers had a cutaneous distribution of psoriasis that had a tendency to be mostly acral, involving the dorsum of the digits and hands; the strange thing was that the distribution resembled the one seen in patients suffering from HIV. However, doctors are yet to crack down on the exact molecular mechanisms by which the consumption of alcohol exacerbates or triggers psoriasis. One of the theories medical specialists have come up with is the fact that consuming alcohol may increase the production of cell cycle activators and cytokines, which could eventually lead to epidermal hyper proliferation. Even more, the higher susceptibility to minor infections which was generally observed in alcoholics, like those caused by trauma and streptococcus, has also been suggested to be linked with the development of psoriasis. Although genetics and the environment may not be amenable to alteration and prevention, those who suffer from an out of control alcohol consumption can slowly, but surely get in control of their life again through appropriate pharmaceutical interventions and counseling. Because of that, those who suffer from psoriasis will be able to eventually alleviate their symptoms and improve their quality of life. Psoriasis can be mild or it can be extreme and that is when most people will start complaining about the fact that it affects their personal life to a level they cannot cope with anymore. In such cases, it’s recommended that individuals seek alleviation not only through drugs, but also therapy and counseling sessions. Given the fact that they are subjected to social stigma on a daily basis and also to the stress of coping with the disease, it can be quite easy for a psoriasis patient to suffer from depression, have anxiety attacks and even suicidal thoughts. With the advent of more potent drugs and modern therapies, such people can finally lead a more normal life without having to worry feel shackled by their skin disorder.